Infant caregivers strive to build consistency in a baby’s routines and interactions. Trust and emotional security develop when infants learn that their needs will be met predictably and consistently. Our teachers are responsive to your child’s cues about their interests and goals as they learn through play, respond to books read aloud, and begin finger plays. Even daily routines, such as diapering, can be an enriching experience as teachers talk and sing with babies. 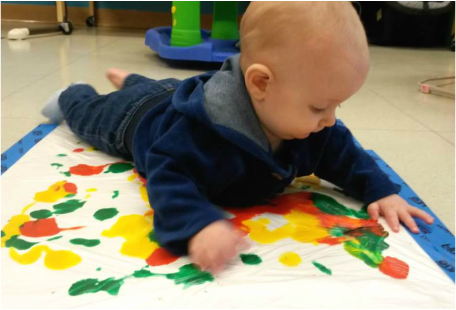 Individualized lesson plans are designed for developmentally appropriate learning levels for each infant. Daily feedings conform to the parent’s guidelines which are discussed with caregivers. This includes transitions to solid foods. 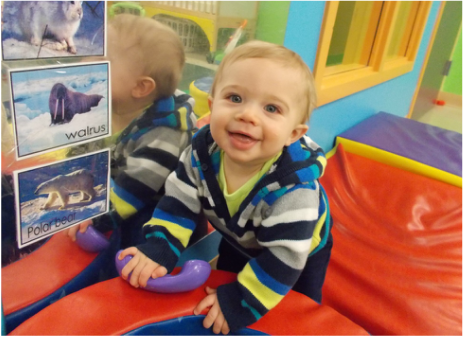 Weather permitting, infants enjoy buggy rides or outside time in a specialized play area. Parent Information Stations are located in each classroom and display weekly individualized lesson plans, menus, and take-home activity cards to provide parents with developmentally appropriate learning activities to do at home.